CMJ produce bespoke joints for Hard Flooring, Natural Stone and Slate. We specialize in colour matching our joints to the grout or the floor finish creating a stylish designer look and a seamless finish. All hard flooring moves independently by expanding and contracting at different rates so it is a requirement for flooring installations to have Movement Joint protection. Movement Joints are an effective way to protect ceramic and other hard floor coverings from the stresses that cause cracking, tenting or popping on the surface. Clients generally do not like Movement Joints because it is felt that they can be obtrusive and spoil the aesthetic appearance of their carefully chosen floor. Specifiers and installers know that Movement Joints need to be used to absorb the natural movements in the floor. Architects are required to specify products that are fit for purpose and conform to building regulations and installers have a duty to provide good advice and workmanship. What ever your job title, our team of friendly and experienced staff at CMJ are on hand to help guide you though the requirements of your projects. CMJ Movement Joints have been specified on many projects including retail, commercial, transport, education, hotels, sport & leisure, prisons and even the Olympic Village at London 2012. Major car brands including Ford, Mercedes, Audi and Volkswagon to name a few have used our Movement Joints because they create a high class finish and also a seamless designer look which is a preferred finish in car showroom areas. Movement Joints are also used in the workshop areas because of their ability to handle a wide range of loadings and their durability. Movement Joints are available in PVC, Aluminum, Stainless Steel and Brass. Our advice is that unless cost is an overriding issue we do not recommend the use of PVC profiles. 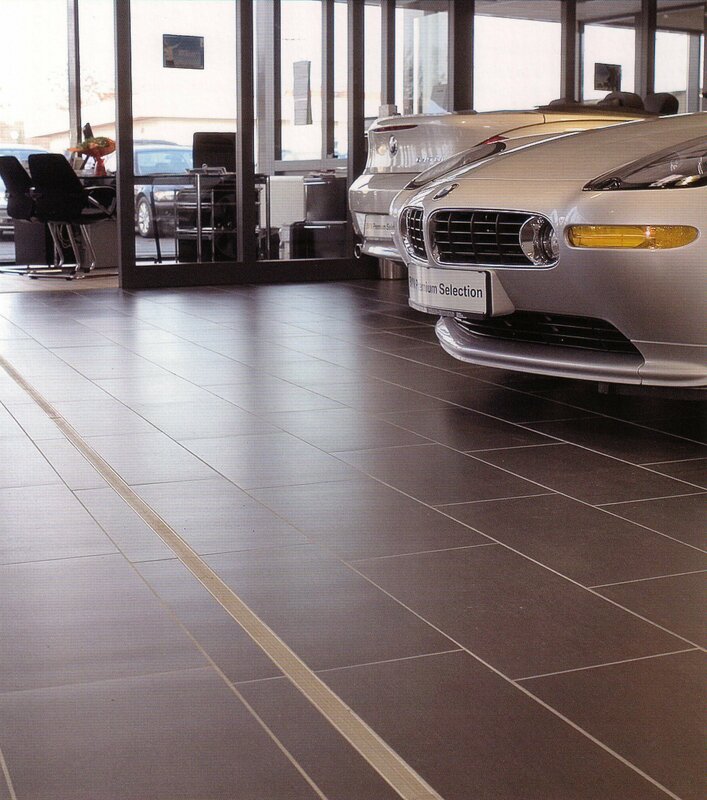 They are a short-term solution and lack durability that is needed for tiled flooring. Using aluminum based profiles adequately protects the majority of projects. Stainless Steel profiles provide the greatest strength but are the least visible due to the manufacture and design of the profile. Not only can CMJ Movement Joints cope with heavy stresses and distribute them evenly between the foundation and floor covering, they can also prevent conduction of noise from footfall and other bodies. Even floors subject to heavy stresses remain in better condition for longer when our Movement Joints are specified.